After hearing that comment, high-school seniors such as my younger sister Annie are left wondering if they will be able to rely on federal student loans (also known as Stafford loans) to make up what their parents can’t pay. While I have been fortunate to borrow money from my parents to avoid incurring student-loan debt, Annie will not have that luxury. Our family’s financial situation is not unique: According to the most recent Department of Education survey of 2007–08 graduates, about two-thirds had to borrow money for college. Depending on the outcome of the presidential election, future generations could have few opportunities to borrow. This fall, I will be canvassing for President Obama, the candidate who has not just committed himself to addressing college affordability but has a record to show. Since becoming president, Obama has tackled the challenge of rising tuition costs through several reforms. In February 2009, he passed the American Recovery and Reinvestment Act, which includes $15.6 billion in Pell grants (financial-aid packages provided by the federal government to low-income students.) Through his 2010 Health Care and Education Reconciliation Act, he allocated more than $40 billion in Pell grants and mandated future increases to accommodate increased tuition costs. In addition, the bill guarantees that all students assuming new loans as of 2014 will cap their repayments at 10 percent of their income and receive debt forgiveness after 20 years. For those who are wondering what might happen to government-issued financial aid under a Romney administration, the answer lies in the Republicans’ House Budget Resolution, which was rejected by the Senate. Paul Ryan’s 2013 budget plan would unravel Obama’s progress in two significant ways, first by eliminating automatic increases for the Pell grants while narrowing the standards for student eligibility, and second, by allowing the currently subsidized interest rates on Stafford loans to expire. In other words, instead of paying the current 3.4 percent interest on her future Stafford loans, under Ryan’s plan, my sister would have to pay a whopping 6.8 percent interest rate. If you want to know where the GOP stands, look no further. While Ryan can be commended for working three jobs, his comments only reveal how little he understands about the plight of today’s college graduates. As the Associated Press reported in April, 53.6 percent of bachelor’s-degree holders under 25 were jobless or underemployed last year. At a time of high unemployment, ballooning tuition expenses, and a growing national debt, we don’t need to be told to get a job. This coming election, students will have the opportunity to choose between two candidates going in very different directions: One sees education as a necessary investment in America’s future. The other treats education as a privilege reserved for those who can afford it. I know who I’ll be voting for. Danielle Charette ’14 is an English major from Durham, Conn., who writes for The Phoenix and Daily Gazette. This summer, she was a Robert F. Bartley Fellow with The Wall Street Journal editorial board. Here at Swarthmore, our close-knit community, clubs, friendships, sports, gardens, and faith organizations constitute what Edmund Burke once labeled the “little platoons” of civic life. 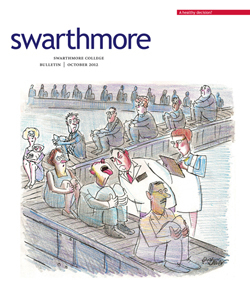 Surely Swarthmore is a liberal arts platoon, defined by our circle of intelligence, hard work, and pluck. All citizens—not just Swatties—ought to benefit from such lively individualism, combined with community-oriented purpose. It is for this reason that I am supporting Republican nominee Mitt Romney for president. Gov. Romney will help America regain her footing and perhaps foster virtue in the process. Between the Bush and Obama administrations, our nation has been on a bureaucratic bender. The level of federal spending, which now accounts for 25 percent of GDP, quite literally gives me the jitters. Businesses and households face grave tax uncertainty. In this regulatory climate, the Federal Register’s 82,000 pages pass as acceptable literature. Between his private-sector career, Massachusetts governorship, and patriotic rescue of the Salt Lake City Olympics, Gov. Romney has demonstrated the economic know-how America badly needs. He’s vowed to trim government, cut taxes by 20 percent across the board and renew state and local governments as the true laboratories of democracy. Americans my age have no expectation that Social Security or Medicare will be solvent in the coming years, let alone by the time we reach retirement. Gov. Romney endorses key elements of running mate Paul Ryan’s budget. This includes gradually raising the retirement age, reforming Medicare as a premium-support system, and means-testing our entitlement plans. Too many government programs are unfunded promises, either dating from a bygone era or betting on an unfunded future. I feel no allegiance to the old agreements that brought us agricultural subsidies and new bankrupting boondoggles like high-speed rail. My commitment, rather, is to the promise and potential that first inspired this country. It’s time to revive the prose of the Declaration of Independence and the contract that is the U.S. Constitution. Between dubious arguments about interstate commerce and health-care stipulations that violate personal choice and First Amendment rights, the Obama administration has shown a lack of regard for America’s historic documents. I don’t think this is out of any particular malice on the part of the president so much as a lack of limiting principles. Without a Madisonian voice whispering in your ear, it’s difficult to justify what is appropriate for government to attempt and what is best left to individuals and their voluntary spheres. I’m not delusional; I doubt Mitt Romney is currently sitting by his New Hampshire fireplace re-reading the Federalist Papers. But I’m a conservative, not a utopian, so I’ll settle for Gov. Romney as a solid nominee who understands that liberty and free enterprise have unleashed the greatest prosperity history has ever known. That prosperity hasn’t been perfect, just as unregulated all-nighters in McCabe Library haven’t always translated into brilliant thesis papers. But freedom is about as good a virtue as politics offers. With the unemployment rate persistently above 8 percent (approaching 17 percent for 18–24-year-olds! ), it’s time for the USA to unleash a little old-fashioned liberty. Someone needs to inform both candidates that no president “creates jobs.” Innovation does that, and Gov. Romney has hands-on experience in the world of markets, bottom lines, payrolls, and entrepreneurial risk. That doesn’t mean he’s Scrooge. Rather, Gov. Romney is aware that supply and demand motivates—and enriches—human capital. This fall I will be canvassing with the Swarthmore Conservatives to promote alternative viewpoints on campus and throw some Garnet pride behind Gov. Romney. I’ll continue writing for The Phoenix and Daily Gazette to promote a classically liberal interpretation of the news. I’m also joining the Intercollegiate Studies Institute’s book club, where college students can gather to read the works of conservative old-timers like Adam Smith and Russell Kirk. Such is my life aboard the Swarthmore platoon. Originally founded—in the midst of the Civil War, no less—by a spirited bunch of Hicksite Quakers, Swarthmore has a history of marching to the tune of progressive causes. But conservative students like me find plenty to cherish. An opportunity to partake in the ideas and philosophies that undergird this American union may top my list. Gov. Romney is a successful and responsible presidential candidate. He likely won’t win the Swarthmore community’s majority vote, but I hope he wins the nation’s.